SANTA MONICA, CA, UNITED STATES, October 30, 2018 /EINPresswire.com/ -- Recruiting for Good is Celebrating Women in Los Angeles; by sponsoring The Beauty Foodie Club. 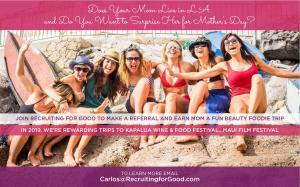 The staffing agency will help family members whose moms have made a difference for 10 years or more; fund a special all-inclusive Moms Party in Maui trip to gift on Mother's Day. Carlos Cymerman adds, "Our personal and meaningful fund gifting service is meant to make a lasting difference...join us to celebrate mom all year long, and change her life for good."